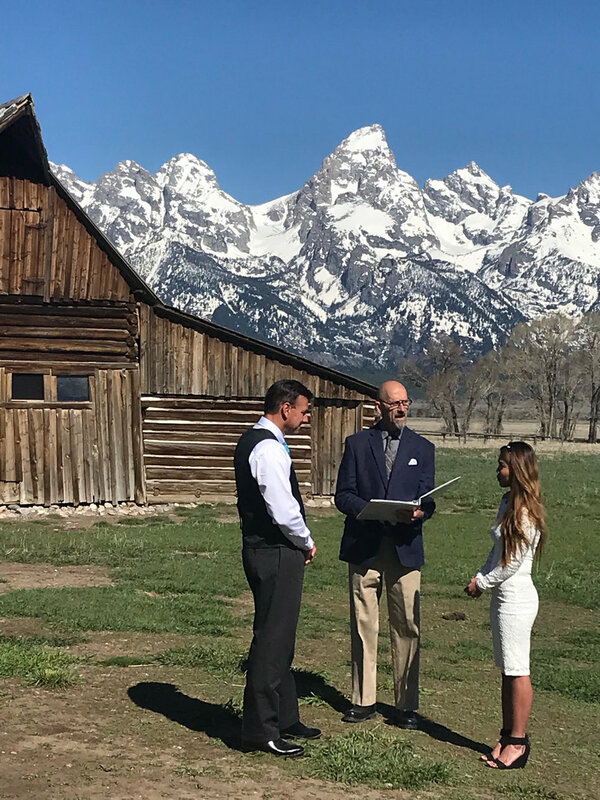 I am the only secular Humanist Celebrant (Officiant) to offer wedding ceremonies in the Greater Yellowstone region - specifically Jackson Hole and close areas. The weddings and other life events at which I officiate are for the non-religious or those who find their spirituality more aligned with secular humanist values. I am a member of the American Humanist Association and my ordainment as secular clergy comes through an affiliated organization – The Humanist Society. Please see my certificate and letter of appointment from the Humanist Society. My journey to becoming a humanist clergy, and therefore finding meaning in helping others celebrate occasions, such as weddings, funerals, coming of age, births, is covered in the 75th issue of The Humanist magazine, Jan/Feb 2016. See my article here. The Jackson Hole News & Guide also wrote an article about me. See the article here. About Humanist Celebrants: Humanist Society Celebrants are Clergy since the Society was chartered in 1939 as a religious organization, in order to allow its people the ability to perform weddings and other ceremonies. When Certified by the Humanist Society, Humanist Celebrants gained the same legal status in all 50 states that clergy of "traditional faiths" enjoy. Any regulations or stipulations regarding registration as clergy that applies to them also applies to Humanist Celebrants. Celebration of Life is central to a meaningful humanist philosophy, and Humanist Celebrants officiate significant celebrations vital to humanist life. Choosing Hamish as our officiant was one of the best choices we could have made for our intimate elopement in Wyoming. He was extremely helpful in deciding on a location to host our ceremony in Grand Teton National Park, he was knowledgeable regarding the area and permit requirements, and he was prompt in answering any and all of our questions - no matter how big or small. We are so grateful that we were able to share our wedding day with him, as he was incredibly thoughtful, courteous and always professional. Thank you, from the bottom of our hearts! Thank You so much for a wonderful ceremony! We could not have picked a better officiant for our beliefs and wedding ceremony vows. We wanted a non religious but absolutely spiritual event and you did exactly that. Thank you for coming to the location and enduring the excruciating cold! We will remember the day forever. Thank you so much for closing the loop and for being such a lovely part of our ceremony. You were exactly what we hoped for in your tone and delivery. It was such a pleasure to work with you. Thank you so much for all your help with putting together our day, it was absolutely perfect and simple and your blessing will stay with us forever. We are glad we had someone who appreciates and loves the outdoors as much as we do. Leading up to our wedding, Hamish helped us arrange our ceremony, declarations of love, and coached us through writing our own wedding vows. He was such a wonderful resource for guiding us through this process. When we arrived at Hamish's office on our wedding day, we embraced him as though we'd known him forever, even though it was our first meeting.. Our wedding ceremony was intimate, giggly, fun and so special. I appreciate so much that Hamish provided a space for us to be ourselves, to not take things so seriously, and yet still honoring our marriage as very sacred. I am so grateful that Hamish will forever be part of this blissful memory." "My husband and I just returned from the most spectacularly romantic and fun elopement wedding in Jackson Hole, Wyoming. - and we owe so much oof our experience to Hamish Tear. I reached out to Hamish for the first time to inquire about his services back in March, well ahead of our proposed December wedding. Not only was hamish quick to respond, but he was also very curious to learn more about us, our story, our vision for our ceremony and the style of wedding we wanted. He was most accommodating to our desires, and gave us all the instructions we needed to file for our marriage license. When I told Hamish that we were eloping without witnesses, he arranged for his wife and a friend to witness the ceremony for us. "Thank you for your help. It was great and my family also thought you were great, and very funny." "Very thoughtful and communicates throughout. Did all of my wishes and addressed an interfaith wedding beautifully as we asked. Very fast on filing the certificate so we could pick it up the next day. Great guy!" I have had the opportunity to work with Hamish as he officiated weddings I was hired to photograph. We've worked together on several occasions. I was very impressed by Hamish’s professional dress and ease of conduct during the ceremony. He is detailed in the planning and officiating of the ceremony, as well as the paperwork that accompanies a marriage. The ceremonies are secular/non-religious and have a very natural flow to them. The elopements I’ve witnessed him perform are earthy, authentic, genuine, and intimate. I highly, and happily, recommend Hamish to all my inquiries as my officiant of choice to work with. You will be pleased with your experience with Hamish as your officiant." Janelle Andersen, Wedding Photographer, August 2016"Thank you so very much for your kindness, advice and flexible, speedy responses. You made the process so simple and our big day so wonderful." "Once more, thank you so much for all you have done! We appreciate your efforts, thoroughness and thoughtful actions." "The weekend couldn't have turned out any better! Thank you so much for facilitating this wonderful moment for us; our families loved it."